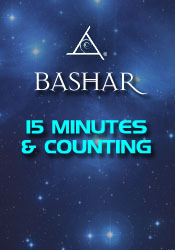 Bashar kicks off this powerful weekend event discussing the importance of the 15 minute time span as an important tool in making changes in your thinking and behavior. Are we going to be inventing new economic systems to replace the old ones when they fall away. Sometimes I wake up feeling activated, joyous and excited in the morning, and sometimes it’s just not happening. Do you have any suggestions? Are there various ETs or higher intelligence civilizations that spawn different races or groups on Earth? Could you comment on the different energetic healing modalities that use transmission-based styles of teaching and healing? Is there a group of beings who are working together to create different systems that work for different belief systems? Are there any dance forms similar break dancing on any other planets in any other timelines? Could you give some information about the different species and their contemporary updated agendas in relation to humanity? What do you guys have to benefit from the ascension of humanity? I heard a rumor that you work directly with the hybrid children as a mentor or teacher is that true? What are they learning? Are there specific assimilation lessons? Are they telepathic or do they speak? You told a woman in Sedona that if she went where she wanted to be on Mother’s Day, she would get tangible evidence. Is that true for all the parents? Do the Sassani kids interact with the hybrid kids? If the Greys are emotionless, how are the kids learning about love? Are you still interested in the extraterrestrial contact pact being fulfilled? How soon can I get unstuck in my life to create the life that I prefer? Why do we exist at all? What’s the best way to overcome a phobia? What is the basis of phobia? Is there anything that will help this time of transition go a little bit more smoothly? During meditation, when I’m slowing my mind down to connect, I’m experiencing a lot of pressure in my head. Could you explain what that’s about? How can I become a Jedi Knight? How would I do the supernatural things that they do? Was Krishna a physical manifestation of All That Is? Is Nirvana different than enlightenment? You said we make good TV. How do you see us? How do beings that are outside our planet, see us and our behaviors? Are there beings that have screens on their spaceships where they can see what’s happening on the planet? What would be the purpose of watching someone? How do I experience past and future in the now? Can you help me modify or remove the illusion of separation if it’s appropriate, or to understand it or have the ability to go beyond? How is new consciousness born? I’m confused about the way in which sometimes you talk as if there is a world out there that we are sharing, and we all seem to be living in the same world. Can you explain? If I believe that the world is going to hell in a hand basket, then I inhabit a world that is going to hell in a hand basket? If I create my reality, am I creating you? To what extent am I making up my reality? How do we follow our excitement in light of the struggles we often experience?